I’m still plugging away at my WIP, trying to keep up with the daily word count quota so that I can mark Camp NaNoWriMo off my list of to dos as a successfully completed challenge. Unfortunately, I’ve hit a bit of snag. You know, one of those minor speed bumps where you write an entire scene that is completely out of sync with your character’s profile, or you kidnapped a bad guy when you should have just killed him – now what the hell are you going to do with him – or the pulsating club scene has unfocused dialog that circles around but never quite hits the mark. What is it that Elliot is trying to get out of Gerhard? Do I even know? I think maybe I don’t. 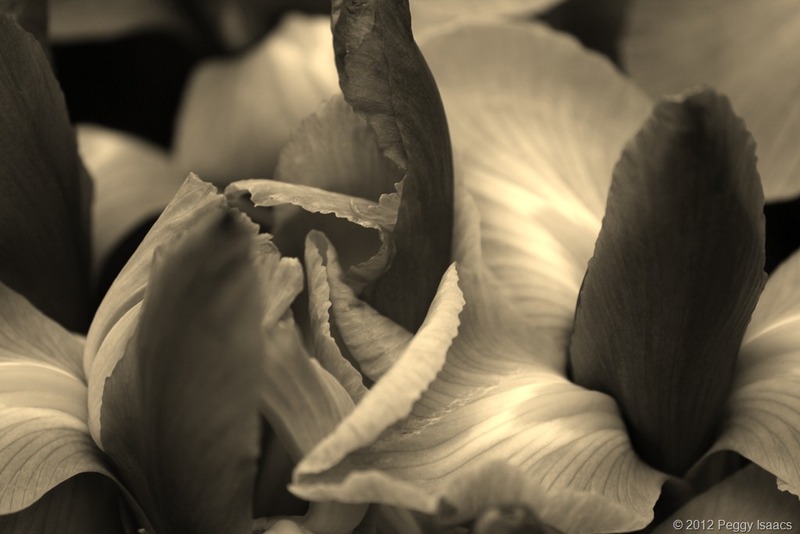 Why on earth would you take a black and white photograph of beautifully vibrant irises? Seems a bit pointless, I know. Indulge me for a moment. I am practicing the art of avoidance. Plus, it’s growing on me. I think it may even look a little bit…cool.